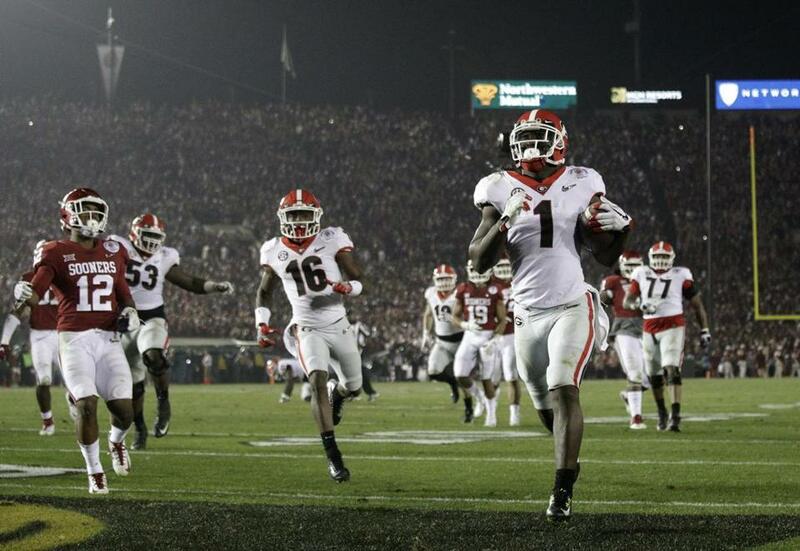 Georgia running back Sony Michel (1) scores a touchdown in overtime against Oklahoma in the Rose Bowl. In the final game of his great career, Oklahoma’s Baker Mayfield threw for 287 yards and two touchdowns, and caught a touchdown pass that gave the Sooners a 17-point lead with six seconds left in the first half. 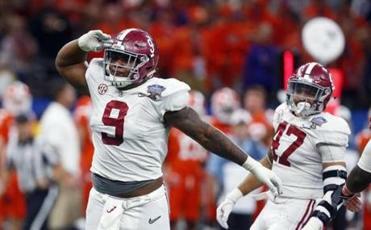 The Crimson Tide won the rubber match of the trilogy, and they’ll play Georgia in the national title game next week. The Bulldogs will play SEC rival Alabama, a 24-6 winner over Clemson in the Sugar Bowl, on Jan. 8 for the national championship in Atlanta, about 90 miles from their campus — with a chance to win their first national title since 1980. The first overtime Rose Bowl was also the highest-scoring, surpassing last year’s 52-49 USC victory against Penn State. There was a lot more on the line in this one, which will go down as one of the greatest Granddaddies of Them All. After an offside penalty on Georgia gave Oklahoma a first down on third and 5 in the second OT possession, the Sooners stalled again and Austin Seibert came out for a 27-yard field goal. Leaping through the line, Lorenzo Carter got his outstretched hand on the kick and the ball fluttered down short of the uprights. ‘‘I can’t believe it’s over. It’s been a wild ride,’’ said Mayfield with a hoarse voice before he started to cry. Both teams settled for field goals in the first overtime, first Georgia’s Rodrigo Blankenship from 38 to make it 48-45. Then it was Mayfield’s turn. A touchdown would have sent the Sooners to Atlanta, but on a third and 2 from the 17, Georgia All-America linebacker Roquan Smith nailed Jordan Smallwood a yard short of the first down. Seibert kicked a 33-yarder and the Bulldogs and Sooners played on, but not for much longer. The Bulldogs came in with the sixth-best defense in the country, but Mayfield and the Sooners sliced it up in the first half, including a nifty reverse pass to the Heisman Trophy-winning quarterback that made it 31-14 with six seconds left in the second quarter. Oklahoma had 360 yards in the first half. Georgia coach Kirby Smart said the defense ‘‘stunk it up’’ in the first half, but there were no dramatic changes in the second. Oklahoma managed only 171 yards and one touchdown in the second half and OT. Oklahoma linebacker Caleb Kelly lowered a shoulder into Michel trying to turn the corner on a sweep and the ball popped loose. Steven Parker picked it up on the bounce, tight-roped the sideline, and raced 46 yards for a score to put the Sooners up, 45-38, with 6:52 left in the fourth. With 3:22 left in the fourth, Georgia freshman quarterback Jake Fromm led a game-tying drive, capped by Chubb’s TD run.